Kevin has informed Jeff that he's going up with Michelle, but that he has safety unless Michelle wins veto. Jeff is pissed! "Why dont you keep your end of the deal and put up Jordan and Michelle? If I win the veto I will take off Jordan and we'll vote out Michelle." 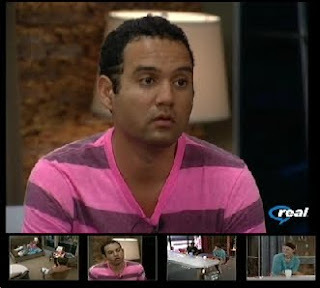 Kevin is babbling about how he doesn't want to give up his power as HOH, but Jeff's not buying it. He does feel bad about it, though, wondering aloud after Jeff left about whether he's doing the right thing. He's off to find Natalie, though, and we know she'll bash it into his head how this is the correct move. Oh God, Jeff is now talking to Natalie, and she's claiming she knows nothing about this, and that she's going to have to talk to Kevin about this. Yeah, right. A couple of years ago, I bought my grandson an antique toy from the 1940's. Some of you may remember the toy or might have seen one. What it is, is a little monkey on a string contraption. You pull the string and the monkey hops around and dances. I was over at my daughter's house today and Jake was playing with the toy. I picked it up and looked at it and I almost fell right off the couch. The little monkey is a dead ringer for Natalie. I'm talking about how that little sucker looks exactly like Natalie. Here's a toy that was probably made in 1946 or 47 and it looks as though Natalie was the model for it. Looks like the wheels are turning ever so slowly in Jeff's head and he is starting to realize that maybe getting rid of Russell last week wasn't the smartest move. Russell would have got rid of Jeff too no matter what he saying now. He would have scared Michelle into thinking that way too. He was dead in the water no matter what.